New York (TADIAS) – President Barack Obama and his family are in Africa this week, on his first major foray to the continent as President since he made brief stops in Ghana and Egypt during his first term in office. 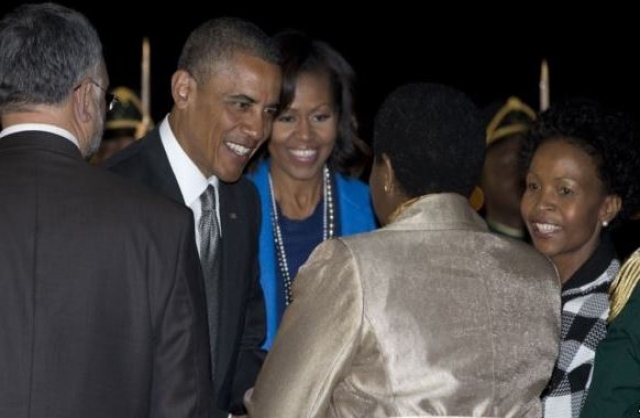 Obama’s current tour highlights Senegal, South Africa and Tanzania. Administration officials say the President’s itinerary was carefully planned to bring international attention to the three “promising and robust African democracies” that stand out as examples in the region for their commitment to sustainable economic progress in conjunction with good governance, respect for human rights, and independent press. President Obama is traveling with an American contingent of business leaders and entrepreneurs to encourage investment in Africa and to strengthen public-private partnerships, which is high on his agenda. In the Ethiopian American community, a quick scan on social media reveals one is hard-pressed to find loyal supporters of the President who have not given up waiting for the White House to hold straight-talk discussions with its friends in the continent regarding corruption, illegal capital flight, crackdown on media professionals, and the continuing trafficking of young, poor and uneducated women for servitude in the Middle East. Still, others had hoped that Obama would become the first sitting American President to address African leaders from the AU headquarters in Addis Ababa during his current tour of the continent, and even weigh in on the Nile controversy between Egypt and Ethiopia – two of the biggest recipients of U.S. aid in Africa. For Benedict Kazora, President of Eastern Africa Diaspora Business Council, Obama’s trip is a diplomatic and economic preemptive strike against the growing Chinese influence in the region. “Congressman Ed Royce [a Republican from California's 39th congressional district], Chairman of the House Foreign Affairs Committee, recently noted that the East African Community, EAC, is the next BRIC countries given it’s growth rate,” Benedict said in an interview with Tadias. Benedict was comparing the East African intergovernmental organisation comprising five countries: Burundi, Kenya, Rwanda, Tanzania and Uganda, with the BRIC economies: Brazil, Russia, India and China. “Therefore this was the most opportune time for the president to visit and establish a firm footing in the region politically, socially and economically,” he said. “I would like to see trade agreements and investment treaties that will help to lift up local entrepreneurs as well as open opportunities to the American business community,” he said.